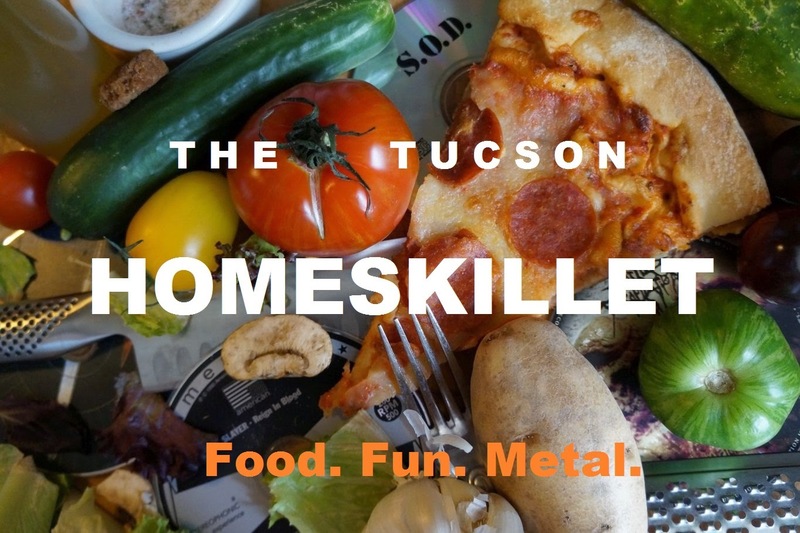 The Tucson Homeskillet: Celebrating our favorite neighborhood bar...Danny's! Celebrating our favorite neighborhood bar...Danny's! I'm going to be honest with you here: When I first went to Danny's...I didn't like it. It was early 2006. Having moved from San Francisco (my home for 12 years), where I experienced some of the hippest “lounges”, scenester hangouts, upscale b.s. clubs along with a slew of smelly ultra dive crapholes, Danny's didn't do it from me. Mainly, I think, it's because smoking was still allowed in bars and me A) being from California and B) never smoking a cigarette in my life I nearly choked the first time I walked through those doors. It was a Friday night and it was packed. The ceiling at Danny's is rather low and with one small front door opened the smoke just cultivated in mid air like a choking bog of Marlboro and American Spirits. Once I sat down, next to the front door with my head literally popped out for maximum oxygen, I had a chance to size up the place. It was cool, nothing special really, just a decent bar for decent people where the drinks were decent and everything was decent. Sure. Whatever. But I was still trying to be mister big fish in a new small pond, so I think that with still glazed eyes from my time in CA and SF and a body still reeling from kicking a year long battle with cocaine, I essentially told myself that I wasn't impressed. Kids, I was a much different person six years ago. Basically....I was a turd. Through time though, things changed, including myself. The smoking ban was initiated and non-smoking drinkers like me rejoiced. The next time I went to Danny's after the smoking ban, which was like the next day I think, the place was much more tolerable. It wasn't busy and I could actually breathe. It was here I began to admire the old style décor, much like your dad's rumpus room from the 70s or your strange uncle's basement bar from the 80s. Worn leather seats, deep captain's booths, vintage Budweiser ads were everywhere giving it a comfortable and familiar feel. Danny's was cool I thought. I like it here. Then, things got even better. When new owners Richard Snyder and Eric “Chili” Hulten took over, they made Danny's even more awesome. The back room, which housed a few old pool tables and broken pinball machines, got a new look, well, an old one, one that matched the retro feel of the main bar, wood paneling and all, was cleaned up and a huge HD TV was installed. The back patio, which didn't exist when I first visited, had tables and chairs installed and even a large chiminea was installed because, you know, it does get cold here in Tucson now and then. The home away from home even felt more like...home. Awesome. A great feature about Danny's is their Sunday Guest Bartender night where folks and fans of the place sign up and can bartend on a Sunday night from 8pm to close and screen their favorite movies on the back wall. Oh yeah, I forgot to mention they show movies sometimes on the large back wall on the patio. Oh yeah. It's awesome. In fact, She-Ra and I had our 5th anniversary there where we ate pastrami sandwiches and watched The Empire Strikes Back. That's how cool the place is. They totally let us do that. What was I saying? Oh yeah...guest bartenders. Yeah, it's way cool, a lot of our pals have done it, even She-Ra and myself. I think we screened Snakes On A Plane and Xanadu that night. We...like to torture our friends and guests apparently. So, if you're out and about on a Sunday I suggest stopping by Danny's and you might see a new or familiar face. 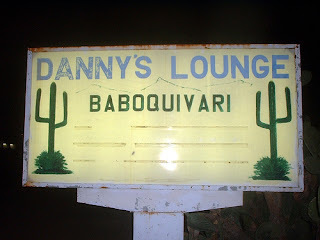 So, I guess your wondering what the whole 'Baboquivari' thing is, right? Well, here's the scoop. The building itself was a bar and restaurant since the 1950s. In fact, when She-Ra and I guest bartended we were surprised to find an old kitchen hidden behind the floppy doors the real bartenders disappear behind to restock or keg beer. It was pretty cool. Old and kinda weird but...cool. Anyway, it got bought out by some lady in 1977 who re-named it The Baboquivari in honor of the sacred Tohono O'odham site near Sasabe, AZ. 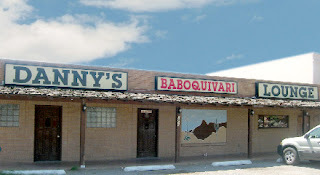 Then the infamous Danny bought it in 1982 and apparently couldn't afford to change the sign so he just added his name and …bingo!, the legend was born. Danny's has gone through a lot of changes, ups and downs, but now, in its almost 30 years of being a neighborhood bar, it's the place you still wanna hang out with the folks you wanna have a drink with. Heck, I had my 40th birthday party there and She-Ra and I just might have our wedding reception there as well. It's fun, comfortable, great jukebox (when it doesn't skip...I still cant listen to A Tribe Called Quest, fix the disc Chili! ), awesome vibe and the drinks are poured according to how awesome you are. You gotta stop by and sit in the naugahyde booths and sip their signature Baboquivari Brew, made especially for Danny's by Nimbus Brewery. How cool is that? Even the owners of a prominent brewery know a good “classy dive” hangout bar when they see one. Did you see who they have in the picture for the review site? That's right. It's us. Are you paying more than $5 / pack of cigs? I'm buying all my cigs over at Duty Free Depot and this saves me over 70% from cigs.